Lively layering with an Italian twist. 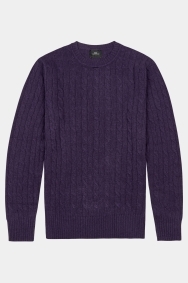 Introduce some purple pizzazz to your wardrobe with this Italian-made jumper from Moss London. 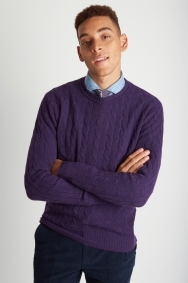 The rich tone is ideal for brightening up a dull day, while the classic cable-knit pattern will work for the office or a chilled weekend lunch outing. The lambswool-rich fabric is soft yet hardwearing, and can also be put through the washing machine for total ease. 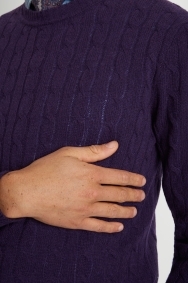 Slip it over a shirt and pair with some stone chinos and brown Derby shoes to really bring out the purple tone. Another very good purchase. 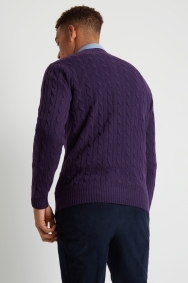 Wide cable knit jumper in select colour : purple will suit a tasteful gentleman. Thank you. Another gift for my grandson and he loved everything about it - the colour, the quality - and I appreciated getting two at a special price.